Food inspiration can come from any place. My sister’s breakfast pizza was inspired by a visit to a gas station, my vanilla carrot bisque came by request of my imaginative toddler, and the internet has recently been flooded with stories and recipes for spaghetti tacos, inspired by an episode of the popular children’s show, iCarly. I’ve got to admit that spaghetti tacos are a genius idea. I’ll probably be serving mine up topped with baby meatballs and cheese. Personally, my inspiration often comes from pictures of food, restaurant menus, or food on tv. It comes through daydreams of favorite flavors and insatiable cravings. In the absence of other ideas, a walk through the grocery store never fails to flood me with inspiration. Most recently, I was inspired by an episode of Barney. Yes, Barney. My boys and I were snuggled up on the couch one recent morning; our typical early morning routine, prior to starting the day. They were enjoying an episode of Barney, while I was poking around the internet. I looked up to see the giant purple dinosaur skipping around a kitchen, followed by a small army of children, throwing pizza dough in the air and singing a merry song. Boy were they having a grand ol’ time! I casually asked the boys if they’d like to make pizza dough someday. In an instant, my three year threw the blanket off his lap and jumped off the couch, excitedly saying, Lets do it right now! I was hardly ready to make pizza dough at that very instant, but we did make it the very next day. Myself being a pizza dough novice, I ran a search online for a basic pizza dough recipe. I settled upon a recipe from Giada De Laurentiis at the Food Network. My husband is skeptical of skinny chefs. I love that about my husband. I just want to know her secret. Regardless, Giada knows her way around an Italian kitchen, so I was fully confident in her recipe. I gathered our ingredients, cleaned our work surface, then called my tiny sous chefs into the kitchen. After getting them cleaned up and reminding them of the importance of clean hands in the kitchen, we set to work. We started by sprinkling one packet of Dry Active Yeast (7 grams) over 1 1/2 cups Warm Water (approximately 100-110 degrees). An instant-read thermometer is helpful in checking the temperature. Water that is too hot will kill the yeast, while too cold will prevent it from activating. Stir until the yeast is dissolved. 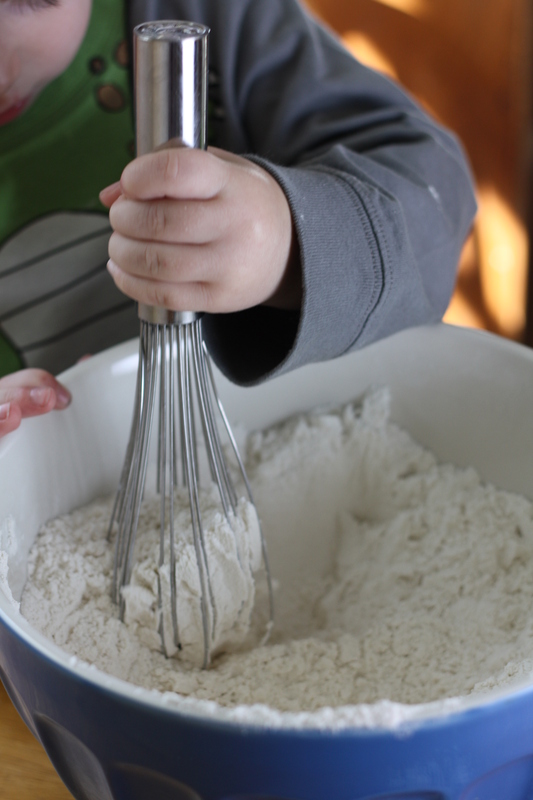 In a separate bowl, whisk together 5 cups Flour with 1 1/2 tsp Salt. Pour the yeast mixture over the flour and stir to combine. If the mixture is too dry, add more water, a tablespoon at a time, until the dough comes together. If the dough gets too wet, add more flour, a tablespoon at a time. 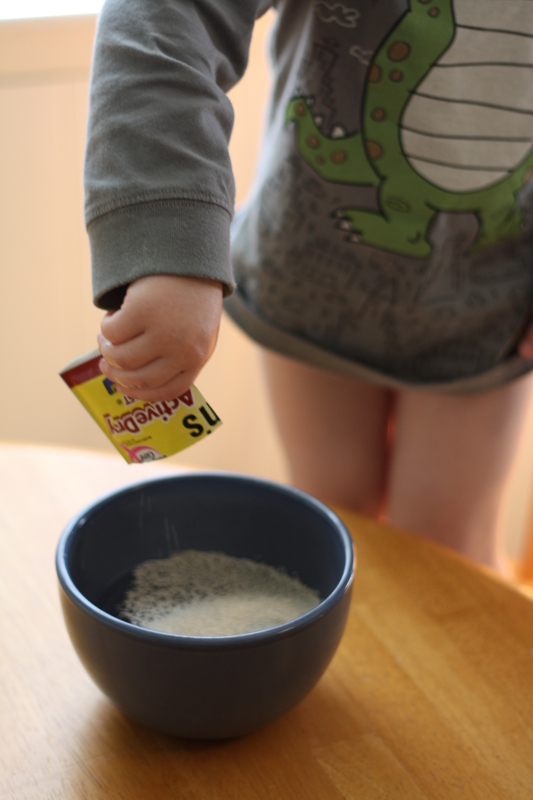 We needed to add a few spoonfuls of additional water to achieve the right consistency. Remove the dough from the bowl and place it on a well-floured surface. 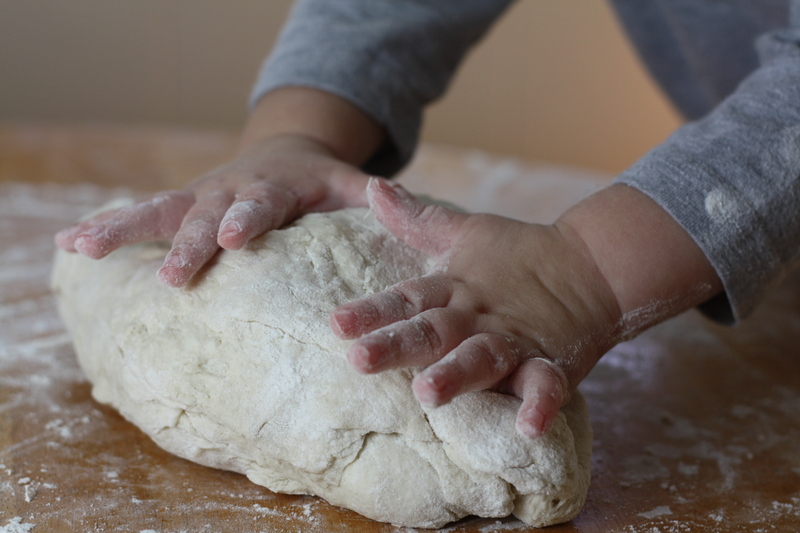 Lightly coat your hands in flour and knead the dough for about 10-12 minutes. Small children make excellent kneaders. Place the dough in an oiled bowl. Turn the dough in the bowl so that all sides of the dough are lightly coated in oil. Cover loosely with a piece of plastic wrap and allow it to rest at room temperature for about two hours. It should double in size. Push down the dough and divide it into 3 equal sized balls. Place each ball in its own oiled bowl. Cover and let rest for another hour. Thoroughly wrap each ball of dough in plastic wrap and refrigerate. You can use it immediately or keep it refrigerated for up to a day. To use the dough, lightly oil your work surface. Press and pull the dough into an 8-12 inch round. 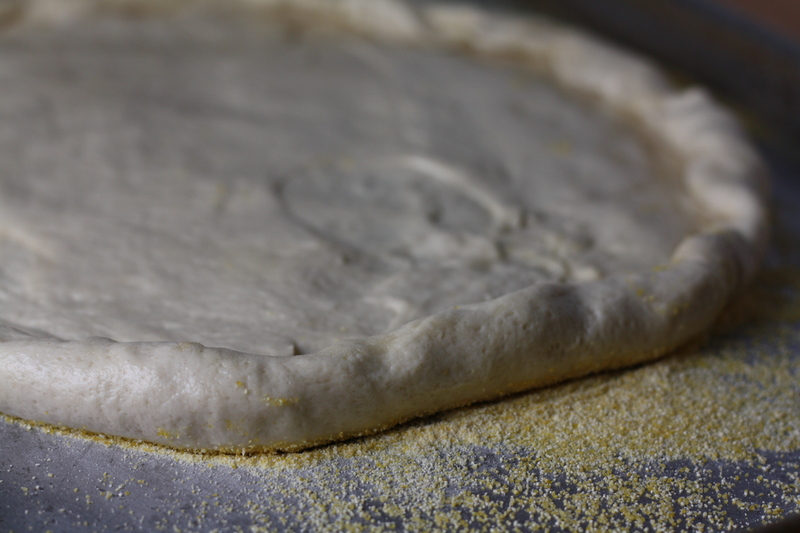 If desired, roll the edges to create an outer crust. 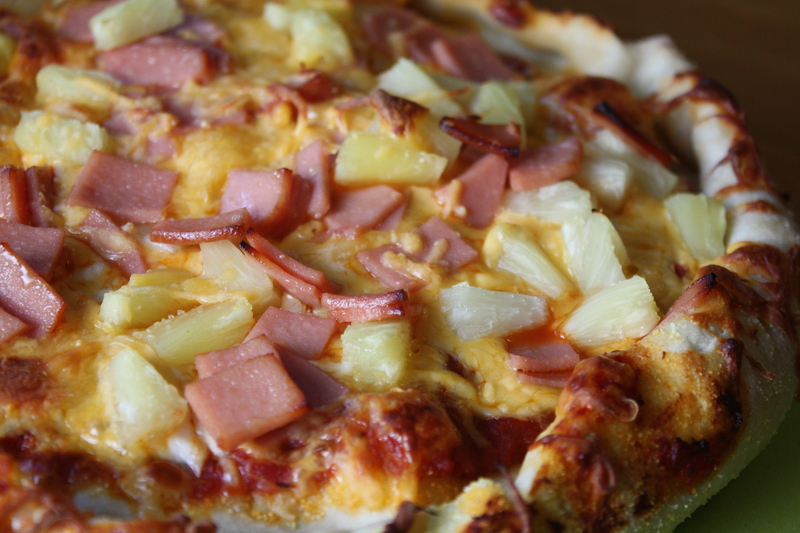 Place the pizza round onto a baking sheet which has been sprinkled with a bit of corn meal. The corn meal will prevent the dough from sticking. Top with your desired sauce, cheese, and toppings. 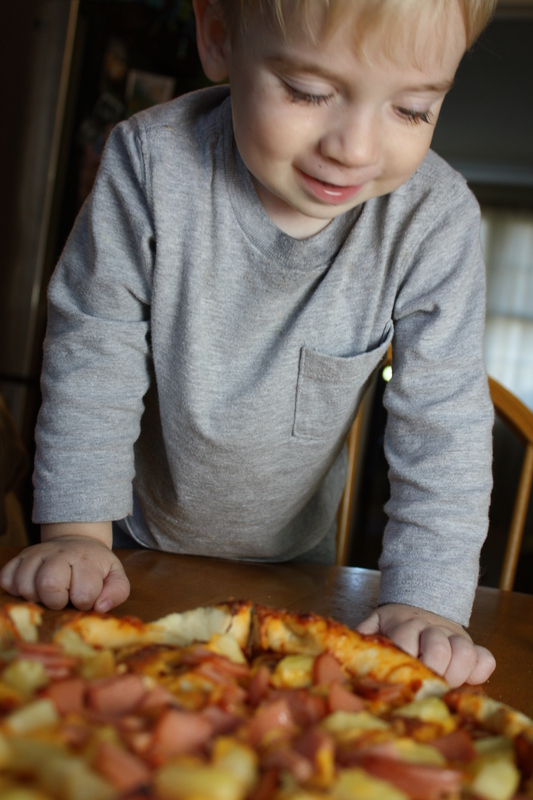 Children love spreading sauce and sprinkling toppings. Set up an assortment of toppings and let them go to town! Bake for about 10 minutes on your oven’s highest heat (about 500 degrees). As you know, I’m a huge fan of cooking with kids. It develops a wide range of skills and helps to develop an appreciation of food. The process of cooking together is bursting with teachable moments about language, science, and math. It’s engaging, memorable, and helps kids develop a sense of pride in their accomplishments as they enjoy the product of their work. To ensure a positive cooking experience with kids, be prepared. Gather the necessary ingredients and materials ahead of time, so you can keep the process moving smoothly. Muster up all of your patience and be prepared for a bit of mess, which admittedly, is often easier said than done. It’s normal for young children to need repeated directions and multiple prompts to stay on task. 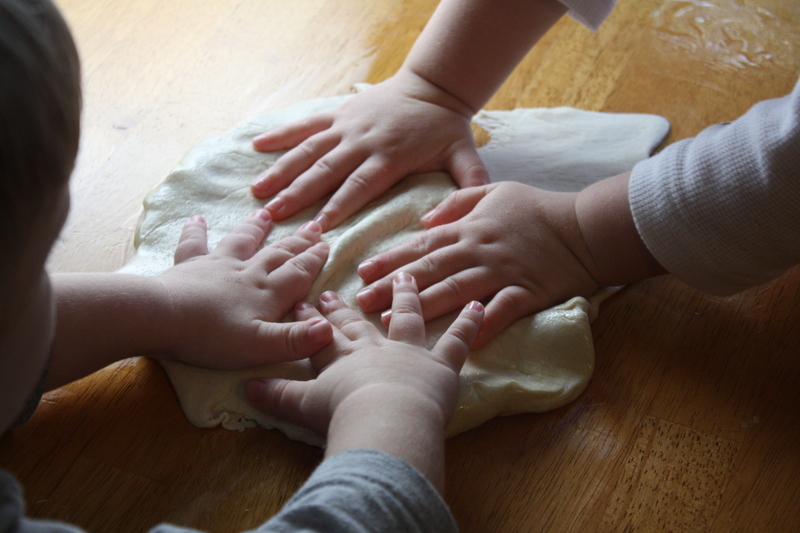 They may find that brushing all the flour off of the table onto the floor is more interesting than kneading the dough. Take a deep breath and try to redirect their attention. Modeling is your best teaching tool. Prior to each step, explain and show children what to do. If necessary, guide their hands as they complete each step. Finally, talk, talk, talk as you cook. Talk about the procedure. Talk about the ingredients. Discuss how the yeast makes the dough grow. Make predictions about what will happen next. Ask questions and engage their curiosity. 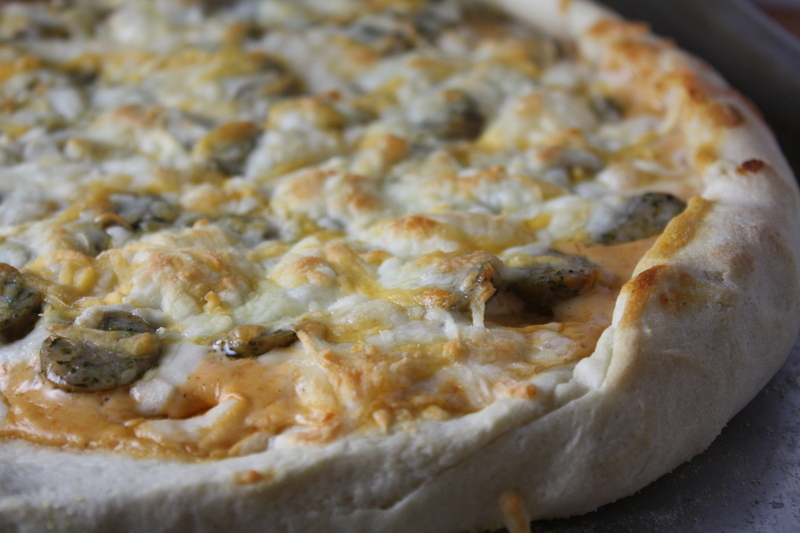 This pizza dough recipe is a winner! 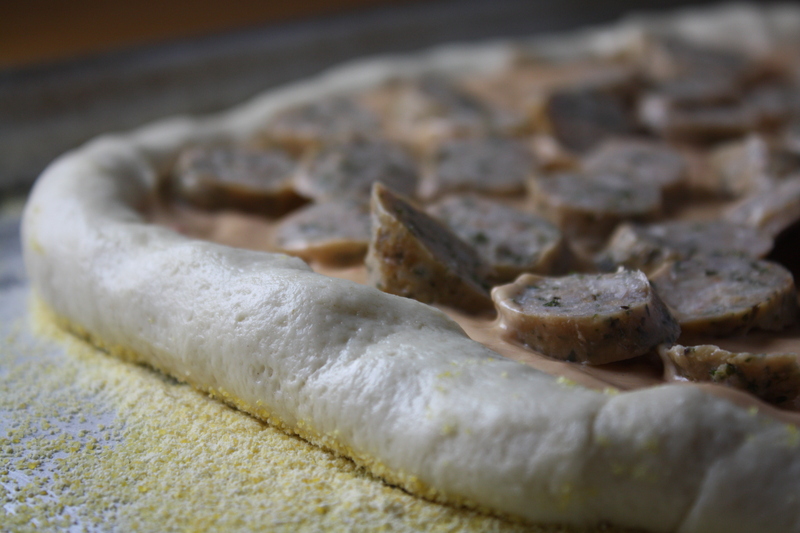 It comes together easily, is a cinch to work with, and tastes perfectly doughy and delicious. It would be delicious with any combination of toppings. My husband and I enjoyed one of the dough rounds with a few ingredients we had on hand; Bertolli’s Four Cheese Rosa Sauce, sliced pieces of leftover Wine and Cheese Sausage, and a generous sprinkle of a Monterey Jack cheese blend. 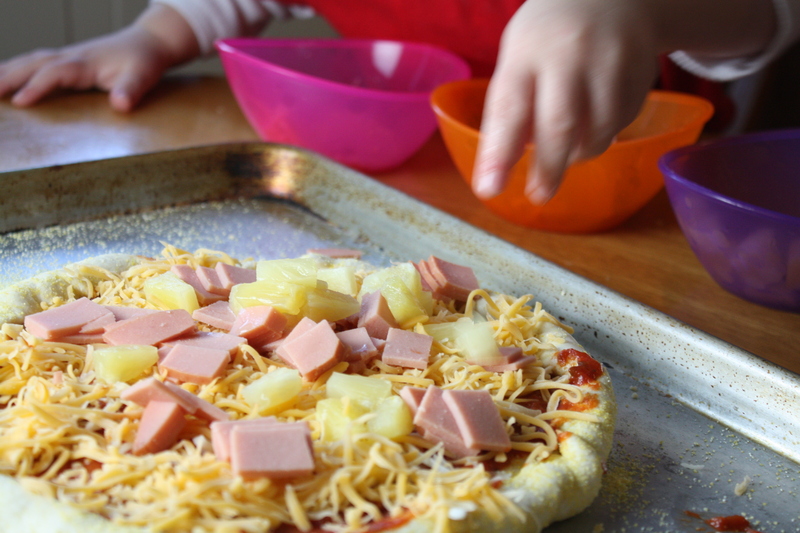 The kids chose traditional pizza sauce with mild cheddar, bologna, and pineapple tidbits. Such a kids’ pizza! Everyone was satisfied with their selections. This dough will most definitely be making future appearances in our home. Also, keep your eye out for a basic pizza sauce recipe, coming up soon! Posted in Baking, Breads, Cheese, Cooking with Kids, Food, Main Course, Pizza, Recipes and tagged baking, bertolli, Cooking, cooking with kids, Food, food photography, kids, life, parenting, pizza, Recipes. Bookmark the permalink. Don’t you just love those chubby little hands!! Too cute.